California’s Delicious, New (Recycled) Drinking Water! Ok, so living in CA has it’s perks and drawbacks. The fact that I have access to the ocean 20 minutes away, great restaurants, nearby shopping and opportunities for a variety of educational and entertaining experiences, along with lovely weather (more often than not), are all solid reasons for me living (and staying) in the land of fruit cakes, wackos and beach bums. But conscientiously collecting shower water every day in a large, back-breaking, orange Home Depot bucket, to use for flushing my toilet, is getting old – getting VERY old. We’ve been using this “toilet to tap” recycled water now since 1997, but only for irrigation purposes. Let our elected officials drink it. They thought it was “delicious” and “good stuff”. Is it a wonder why our state’s education and economy are in the toilet?! On Friday, I read where the company that’s demolishing our iconic Candlestick Park is using THOUSANDS of gallons an hour of fresh drinking water directly from the Hetch Hetchy reservoir to dump on the rubble to keep the dust under control. I’m supposed to consider drinking “reclaimed sewage water,” while they waste delicious, crystal clear, drinking water on keeping the “dust under control” at Candlestick Park? Is it a wonder why people think it’s “wacked” out here? Catch ya next time, looking at life from my shoes! 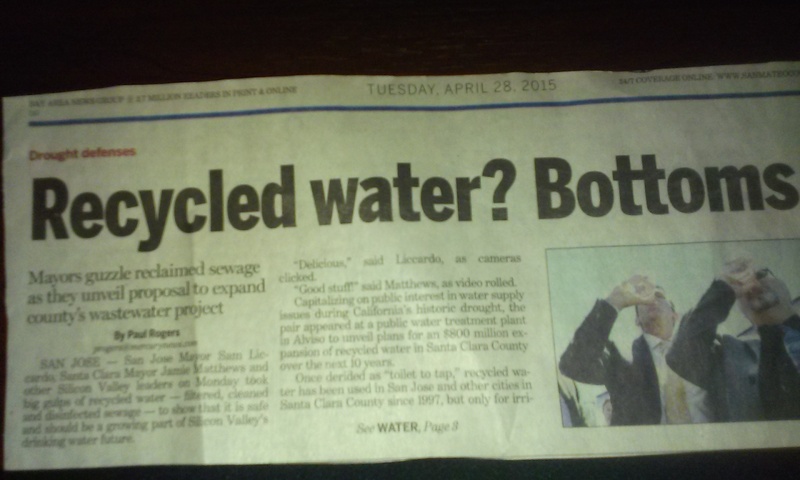 Posted on May 19, 2015 May 19, 2015 Categories Humor, Humor in daily lifeTags California Life, Demolishing Candlestick Park, Recycled water9 Comments on California’s Delicious, New (Recycled) Drinking Water!